A bed of kale sits in front of rotating greenhouses at Blue Zee Farm. Photo by Kirsten Reed Order prints of selected PBP photos. Maine Organic Farmers and Gardeners Association (MOFGA)-certified Blue Zee Farm was the setting for the latest in a series of local farm tours on Saturday, June 13. The tour was co-sponsored by the Blue Hill Co-op and the Blue Hill Heritage Trust. Blue Zee Farm sits just over the Penobscot border on Route 15, but its land stretches across the town’s border into Penobscot. Home to Renata and Mark Scarano and their young daughter Julia, the farm comprises 100 acres of mostly woods. 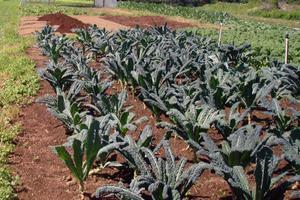 About 1.5 acres are used for organic vegetable growing, using a structured method of crop rotation. Another 15 or so acres yield organic blueberries. The Scaranos talked tour-goers through the planning that goes into each year’s crops. They make up a planting schedule for each greenhouse, keeping track of the number of seeds sown and resulting plants. Much of this information is done on Excel spreadsheets and kept in a binder. They have a field map for their crops grown outside, which are grown in beds 25 feet wide by 50 feet long and rotated every three years. Several greenhouses are also moved each year, and the couple accomplishes this with Mark on one side on a tractor and Renata on the other in a pick-up. Some beds were vacant, awaiting the addition of peat moss and other soil-preparation measures. Other beds were fallow, or resting, and planted with buckwheat and oats, which would be turned under, to enrich the soil for future planting. The Scarano’s approach to farming, and perhaps farming in general, is a mix of careful planning and preparation, hard work, and responding and adapting to eventual outcomes, which can never be accurately predicted. As Mark said: “You win some, you lose some every year.” Without good planning, he said, things could be a lot worse. When asked by a visitor if he would do it all again, knowing what he knows now, Mark was adamant he would. The youngest of seven kids, he grew up on a vegetable farm. The Scaranos spoke of the seasonal nature of farming in Maine, which they enjoy. By August they’re exhausted. Farming stops in November. Then the projects and repairs to various buildings, etc. start. When it snows in December and January they finally take a break. In February the growing starts again, with trays of tomato seedlings next to their woodstove, which are later moved to a greenhouse. 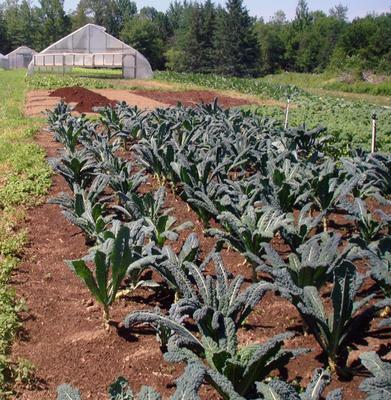 Blue Zee Farm grows in excess of 20 vegetable crops and organic blueberries. They sell their produce to the Blue Hill Co-op, and occasionally TradeWinds Market Place in Blue Hill buys lettuce. But most of their selling is done at markets. Every week, Renata goes to the Blue Hill, Stonington, Deer Isle, and Castine farmers’ markets. 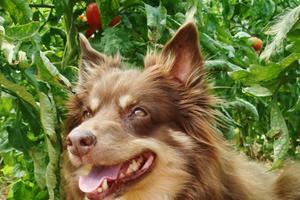 Farm dog Annabelle rests under the tomato plants in one of the greenhouses on Blue Zee Farm.